A Little Curd Nerd is Born! On Monday, 8/21/06, my wife gave birth to a baby girl after 27 hours of grueling labor. Her name is Sasha Gabrielle and she weighed 6 lbs 8 oz at birth and was 20.5 inches long. She keeps telling me she wanted to eat some cheese, but I told her she needs to stick with the breast milk a little while longer. Given all this, you may notice a slow-down in posts here; please bear with me while I do my best to find the time to keep posting. And as always, thanks for visiting the site. Full size image after the jump. 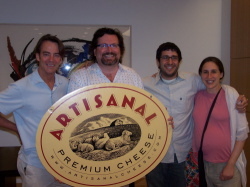 What happened to the NY State Farmstead and Artisan Cheese Makers Guild? Last summer I went to a really fun event at Sprout Creek Farm in Poughkeepsie, NY, hosted by the New York State Farmstead and Artisan Cheese Makers Guild. It was called "Cheese Day" and it featured talks from cheese makers and fromagers alike, as well as tours of the cheese making facilities at Sprout Creek and basic cheese making workshops. I was looking forward to going back this year, but it doesn't appear to be happening. And the guild's website, once an informative repository of New York State-related cheese links, events, and resources, has been down for months. Does anyone out there know what's going on with this organization? Have they folded already, or are they just going through a transition? I've always balked at going to those cheese classes offered around town, mainly because of the price. Both Murray's and Artisanal offer classes in New York City, but seats run from $50 to $75 per class. For that much money I could a) buy a lot of cheese for myself, as well as a book that could explain them to me; or b) go to a really nice restaurant and order a cheese course. Could a two hour class on cheese really be worth all that? Last night I finally got a chance to attend one of these classes, thanks to the generous folks at Artisanal. They invited me and several other bloggers and food journalists to their Cheese & Wine 101 class, taught by Maître Fromager and noted author Max McCalman. Some of the other bloggers in attendance were Danyelle from Restaurant Girl, Joe from Foodie NYC, Jane from The Food Section and Regina Schrambling from Gastropoda. LONDONDERRY, Vt. — It's a beautiful Saturday morning in early June here at the farmer's market. The early summer clouds that had threatened rain all morning have just blown away, and the sun shines on small stands filled with vendors selling dark wildflower honey, pastured duck eggs, organic hoop-house heirloom tomatoes and artisanal cheese from several different producers. Most of the varieties of cheese we eat were originally created in Europe: Brie, Parmigiano-Reggiano, Emmenthaler. But this country can be proud of several distinct varieties that can be called uniquely American (Colby, Brick and Monterey Jack among them). Unfortunately, though, the one variety that goes by the name of its home country is probably the worst cheese anywhere in the world. I also found a nice little film about the neighborhood in Brooklyn where I live. 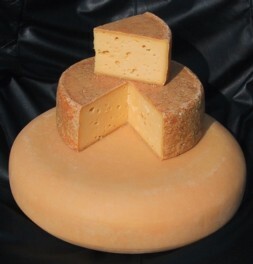 This weekend the American Cheese Society held its 23rd Annual Conference in Portland, OR. Unfortunately, I wasn't able to make it, but it sounds like the conference was a rousing success. According to David Grotenstein, chair of the ACS Competition Committee, this year's conference saw "record, sell-out crowds...and...an unprecedented number of entries for our annual Judging and Competition. 157 producers from 28 states (and two provinces) entered an astounding 941 cheeses, almost 200 more than last year's record 749." There's gold in them thar hills! 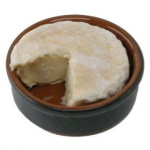 From the Isère departement in the French Alps comes the ooey, gooey, utterly delectable St. Marcellin. Best served with a spoon, it is so soft and creamy that it comes to America in a little ceramic crock pot so that it can survive its arduous trans-Atlantic journey. It is usually aged for one month (which means that peak season is right about now) and has a hearty flavor that is at once mushroomy and barnyardy.